Image via Associated Press, gif by Bobby Finger. PHILADELPHIA — It’s day one of the Democratic National Convention, and everyone is here. Michelle Obama is here. Bernie Sanders is here. Every single reporter in the country is here. Debbie Wasserman Schultz is kind of here. But someone is missing. He has a center part, an amazing attitude, and my entire heart. 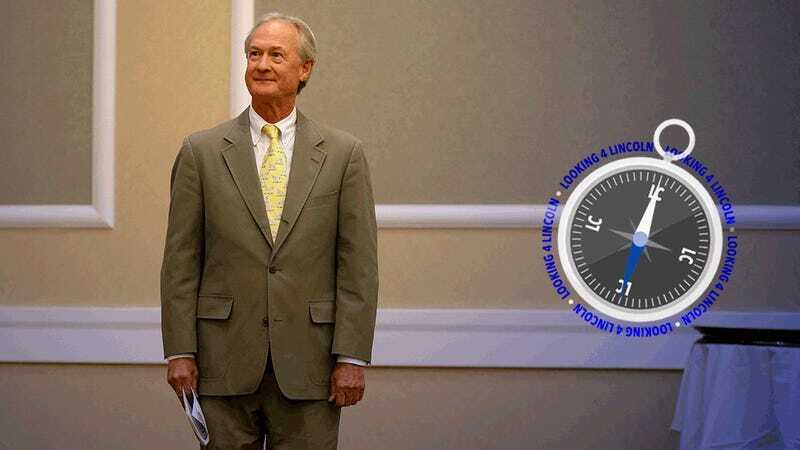 His name is Lincoln Chafee. I have not, thus far, been able to get in touch with the former Rhode Island governor, or determine whether he is even attending this year’s DNC. Like a shy but friendly hedgehog who isn’t quite ready for you to hold him in your hands, Lincoln has stayed mostly under the radar since his October primary defeat. So every day, I will look for him. I looked for Lincoln in line at Panera, where there are muffins and salads, which are things that I think he would like. I looked for Lincoln at a Bernie Sanders rally, because I thought that’s something he might want to check out, just for the experience. I looked for Lincoln next to the men’s bathroom inside the convention center, because everyone has to go! I haven’t found him yet. This has been Looking for Lincoln, a series in which I look for Lincoln Chafee.